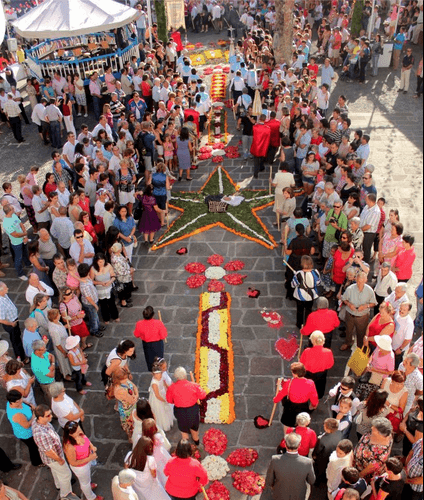 The Summer months from June to September are very festive on Madeira. These are also the harvest months. The festivities are a “reward” for the hard work during the rest of the agricultural cycle / year. Thus, these months are a time filled of joy, celebration, fullness and gratitude. Christianity absorbed these joyous and profane rituals and transformed them into religious festivities. On Madeira, like in continental Portugal, each parish celebrates its particular Saint represented by a relic (object, image, …). Arraiais keep villagers busy during the entire years with preparation works. These preparations (sewing decorations, making garlands, cutting and painting flag posts, etc.) used to occupy long evenings. Villagers gathered and socialized at the same time. Each groups wanted to have a nicer looking street then the next one over. An elegant flower covered paths leads to the main entrance of the churches. A profusion of beautiful and delicate flowers decorates the inside of the houses of worship. They stay open all night to allow pilgrims to pay their respect and make their wishes in person. Religious festivities include mass and a procession parading the image of the patron. Banners, arches with greenery and flowers and nice illumination decorates the streets of the village. Musical and dancing groups follow the procession. Villagers and many people from all over the island come to follow the festivities and many sleep over at friends, family or under fortune tents along the roads. The Patron of Ponta Delgada was normally celebrated on January 1st. However, Winter is not the best season to camp outside around the church. The celebrations are now taking place every first weekend of September. The arraial of Ponta Delgada is special and particularly appreciated. It is particularly large in size and animation of all sorts. 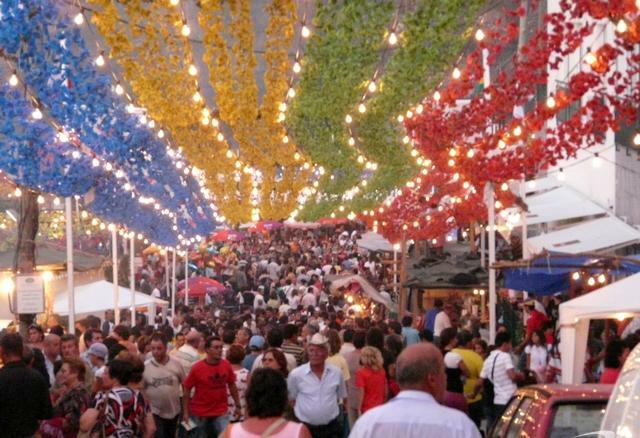 The preparation of the arraial takes en entire year and is a very social event. These preparations have a very social function bringing villagers together. Particularly, young people took advantage of these decoration gatherings to flirt. 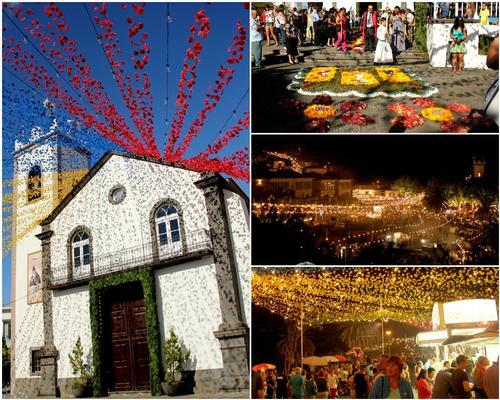 This tradition of preparation with pride, is still very much present in Ponta Delgada. Over the years, the paper flowers have been replaced by plastic flowers. These are nonetheless maintained, repaired and rolled out and hung every year. 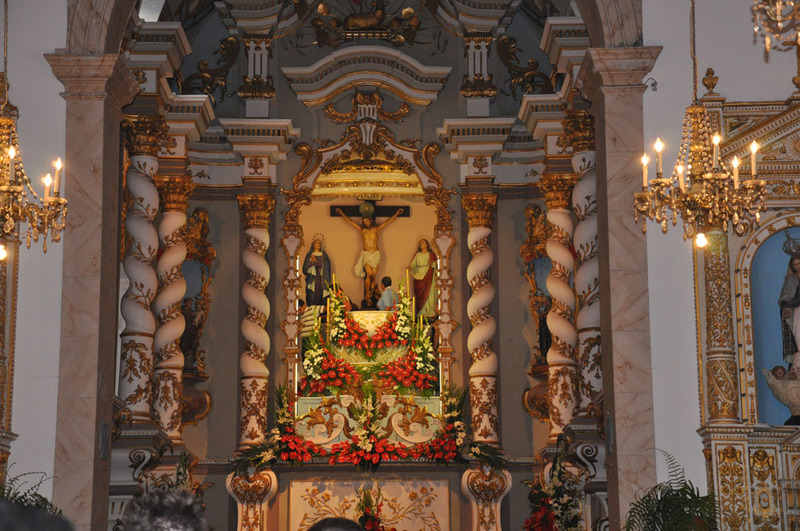 Arraial Ponta Delgada – Up close and personal – Pilgrims wait for their turn to talk with God behind the Altar. Stalls selling food and drinks, toys, clothes and sweets abound on the streets. Many traditional espetada places pop up selling and cooking the typical meat cubes on laurel sticks. “House made bread” or “bolo do caco”, Madeira table wine from local production and poncha accompany the espetadas. Music is another very important component of arraiais. Various philharmonic bands play alongside more local bands using traditional and typical instruments: harmonica, tambourines, castanets, string instruments such as the viola, the braguinha or the rajao. 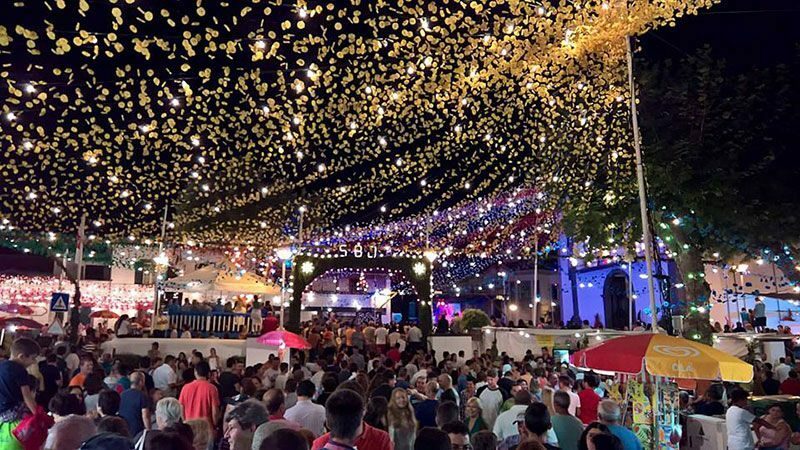 These arraial celebrations are impressive and well worth a visit. They beautifully combine tradition, religion and profane fun. The two largest Arraiais take place in Monte on the South side and in Ponta Delgada on the North side of the island.